Bvlgari is set to launch its boutique in ION Orchard very soon and for those who can’t wait to get in on the action, the luxury jeweller has gotten things rolling with a pop-up store. 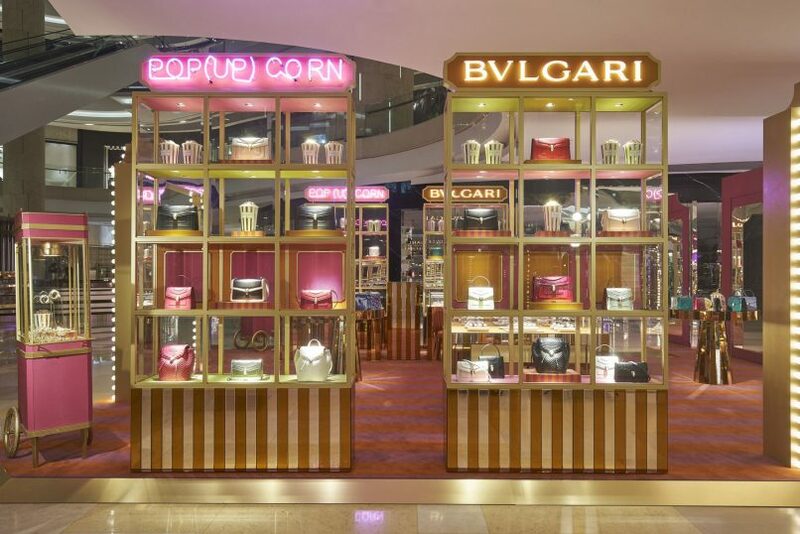 The Bvlgari Pop (Up) Corn is an eye-catching immersive experience for shoppers and fans of the brand alike, and a little peek into what to expect when the actual showroom opens its door. 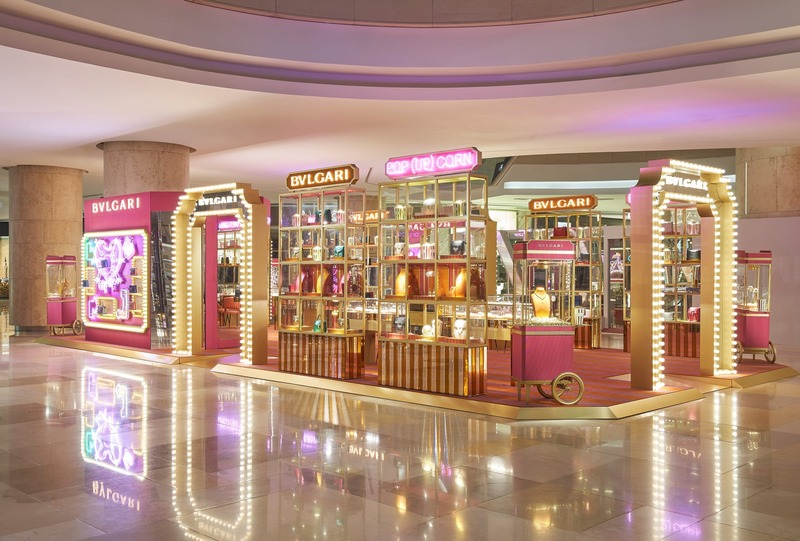 The Bvlgari Pop (Up) Corn is entirely created by the brand’s own interior design team, taking visual cues from retro cinemas together with notes from Bvlgari’s signature aesthetics and the Via Condotti flagship in Rome. Like Bvlgari’s latest Wild Pop jewellery capsule, the Pop (Up) Corn was created with a touch of lighthearted fun all while paying close attention to craft and detail. Welcoming guests to the pop-up is the iconic Via Condotti door frame, realised as gold outlines studded with light bulbs. Elsewhere are ticket stub-shaped banners, neon lights and projectors putting Serpenti bags in the limelight. Popcorn is the main motif in this enthralling space. Ceramic popcorn boxes decked in white and gold dot the space. The pop-up is also surrounded by popcorn push-carts, each showcasing Bvlgari’s signature bags and exquisite jewellery collection. The eclectic palette in the pop-up brings to mind the variety of coloured gems Bvlgari explores in its high-fashion jewellery pieces. 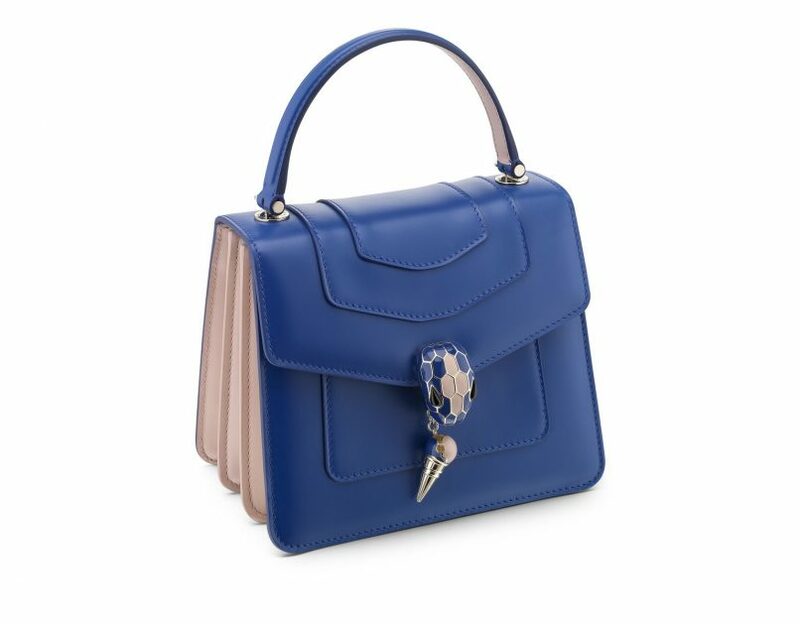 The cinema theme pays homage to its eminent patrons of modern history — the great Hollywood stars of the 1960s, such as Kirk Douglas, Audrey Hepburn, Frank Sinatra, Richard Burton and Elizabeth Taylor (herself, a diehard lover of Bvlgari’s creations). At Bvlgari Pop (Up) Corn, bags from the Serpenti and Diva’s Dream collections will be showcased on gold pedestals ready for purchase. But the real stars in this gig are the limited edition creations exclusive only to ION Orchard. Available here are versions of Bvlgari-Bvlgari necklace and matching bracelet in rose gold and purple sugilite, as well as Serpenti handbags in smooth calf leather — a little excuse to make your way down to this pop-up ASAP.